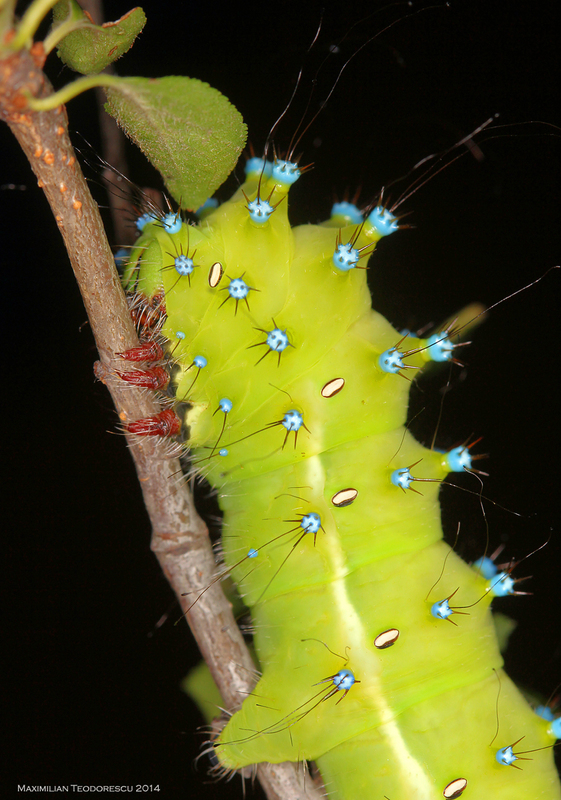 Si ultima larva de Saturnia pyri si-a facut coconul si se transforma incet-incet in crisalida. Acum, dupa aproape doua luni de la emergenta din oua, misiunea omizilor s-a incheiat cu succes, cel putin pentru trei dintre cele 37(!) 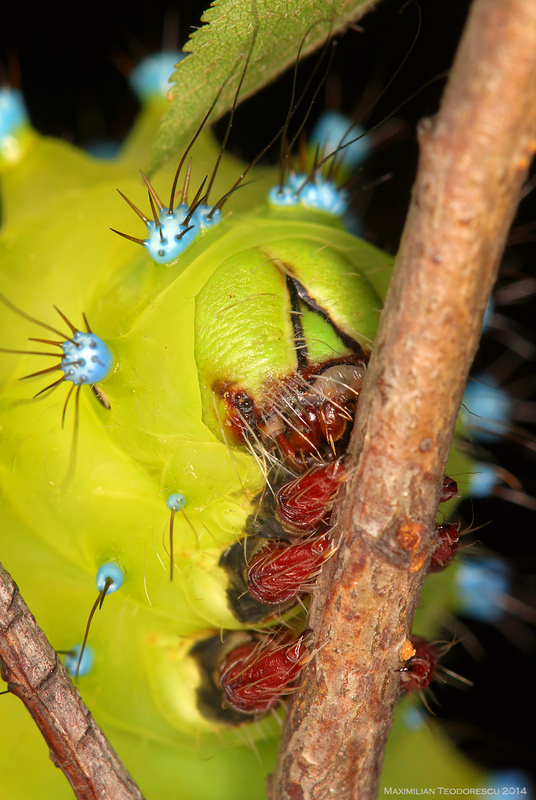 de larve initiale. Acum nu pot decat sa astept emergenta adultilor, in Mai 2015. 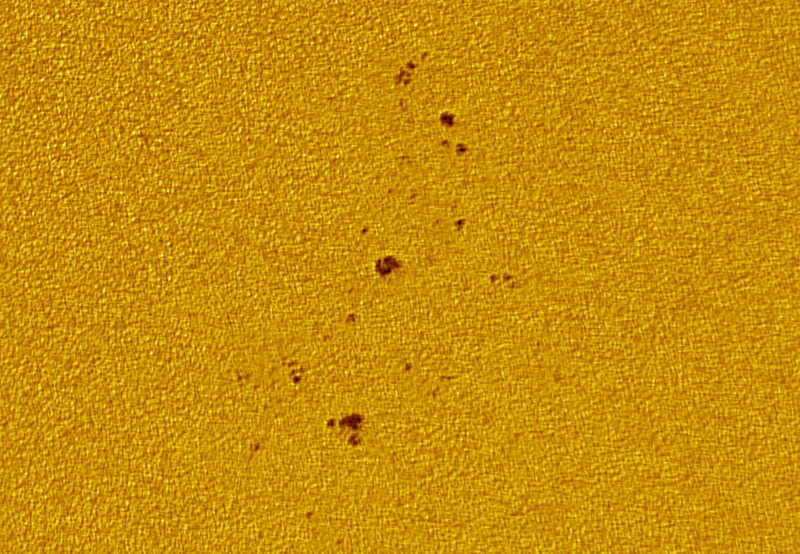 This is, for sure now, my last view of the large sunspot groups AR2108 and AR2109 for a while. 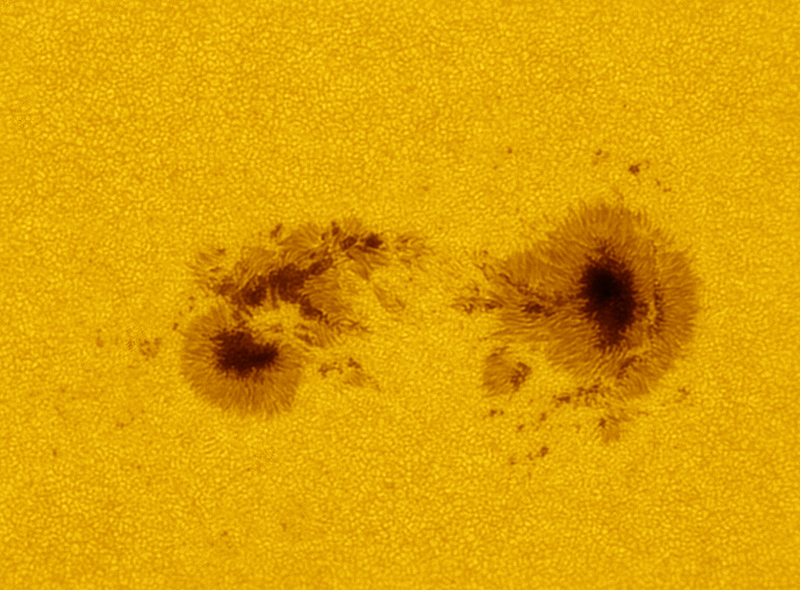 I say “for a while” because some of the larger sunspot groups can survive for a few solar rotations, so it could be possible that in a few weeks time we will see this pair again. But until that moment comes, some last pictures of these “cooler regions”, in poor to very poor seeing conditions, part due to the very hot day (34+ Celsius). 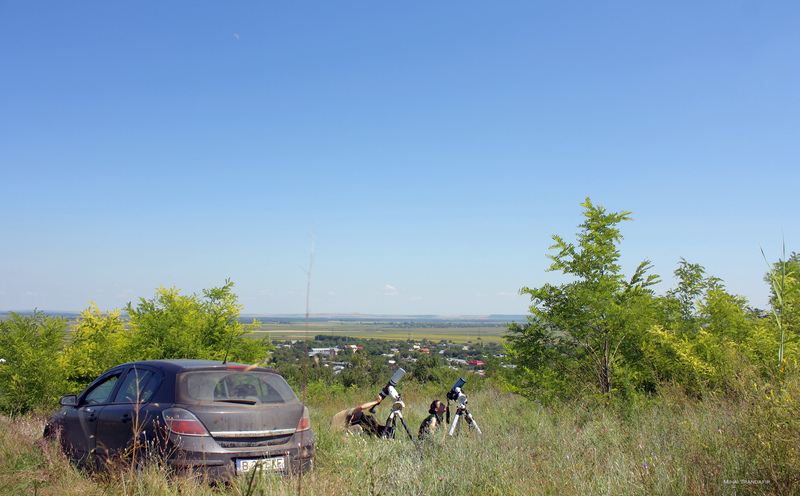 This time I’ve went to my observing location together with my brother in law, Mihai, who helped me with the collimation of my C11, using two interesting methods for daylight collimation (method one, method two). 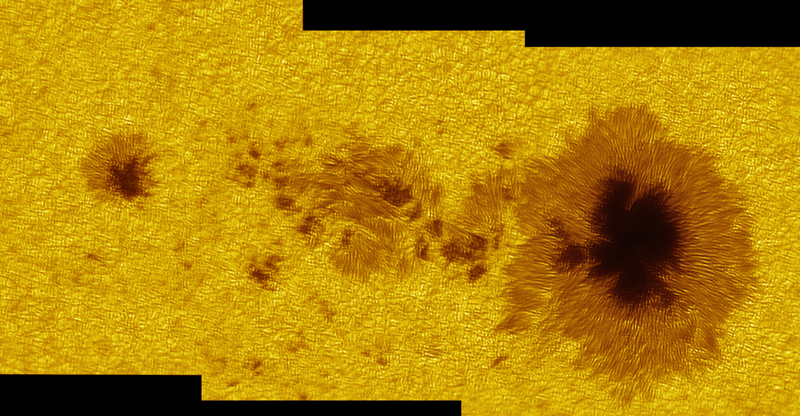 The images below were all made using the C11 at F/10 and F/20 with full-aperture AstroSolar filter, and ASI120MM with Baader Green-CCD filter, in 2-3/10 seeing conditions. 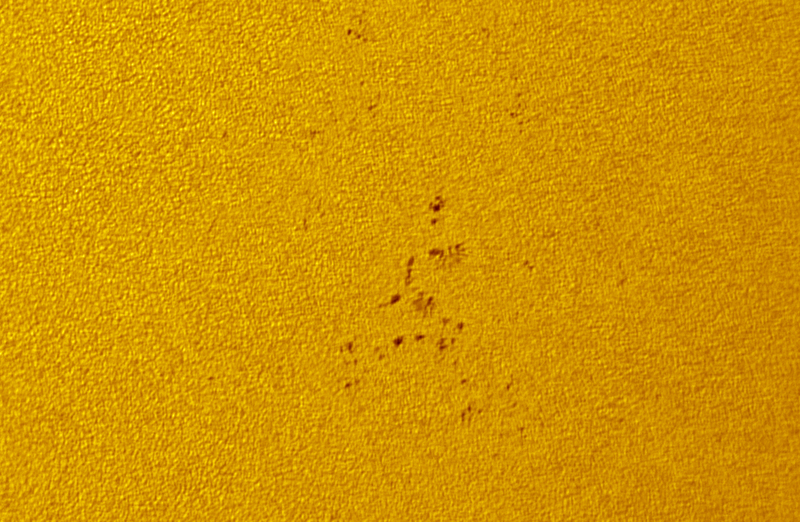 Of course, due to poor seeing, the scope was a bit off from perfect collimation (seen from the images below), but in those conditions I think our first test of daylight collimation of an SCT was a success. 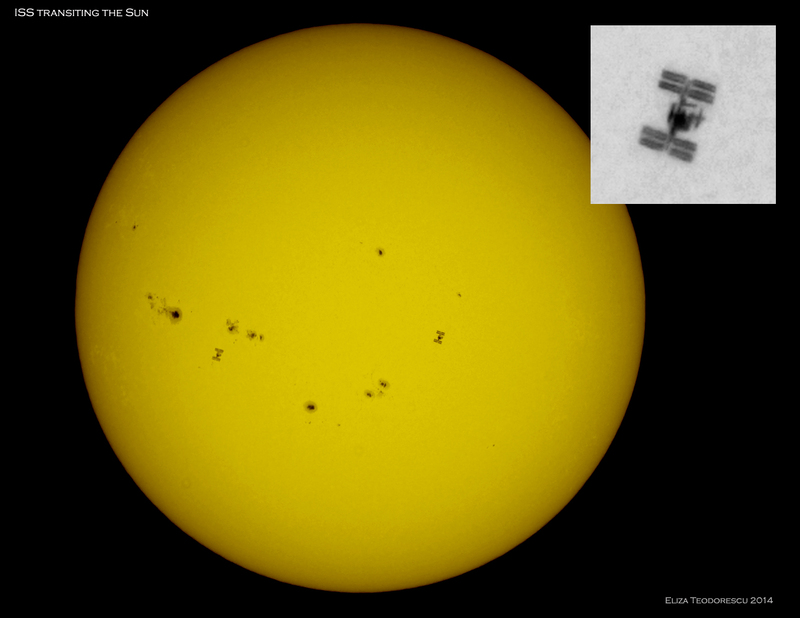 The image above was featured on the first page of SpaceWeather. 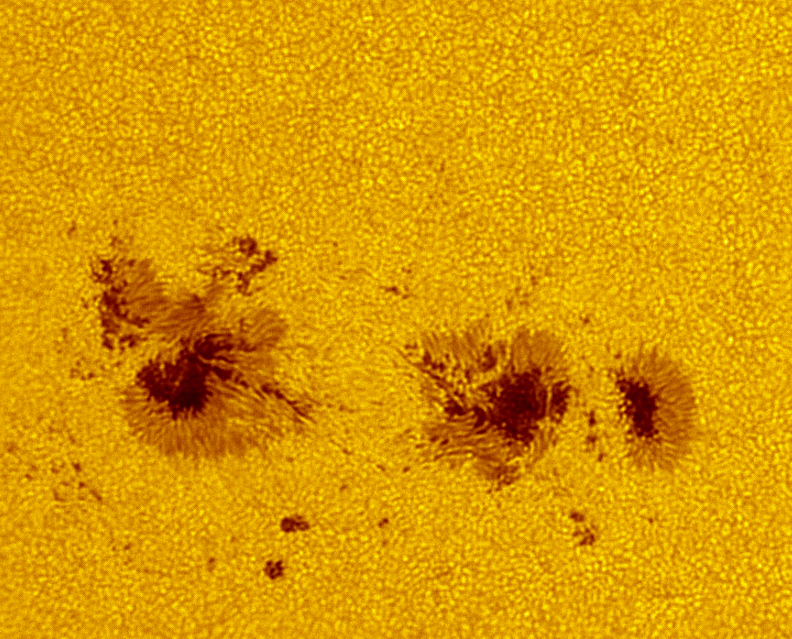 Hope the Sun will come up with another set of large sunspot groups soon! Si cu o oarecare intarziere, revin cu informatii noi legate de evolutia larvelor de Saturnia pyri. La momentul actual, doua dintre cele trei larve si-au facut coconii si se transforma in crisalide, pe cand cea de a treia inca…mananca. 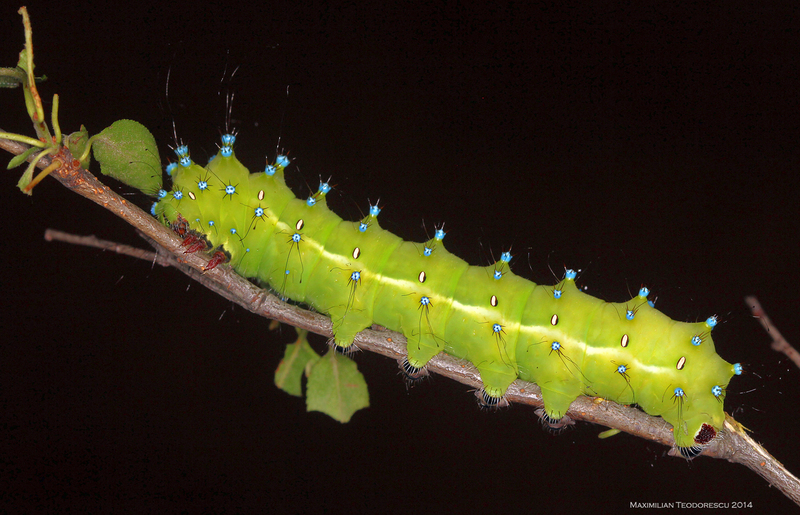 Fotografiile de mai jos prezinta cea mai mica dintre larve, pe 10 iulie (cand au fost relizate fotografiile) avand “doar” 90mm lungime. Acum (pe 12 iulie) are deja peste 100mm lungime. 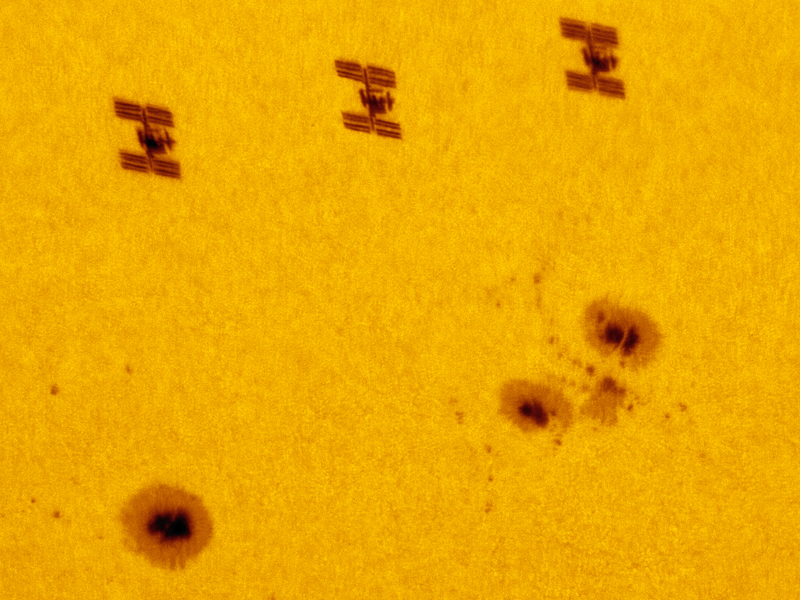 This is perhaps my last view of the large sunspot groups that captured the attention of many solar observers around the world in the last few days. I had only a short window of around 30 seconds today to capture 800 frames in poor seeing conditions, and that was because a large front of clouds rolled in, despite a very promising morning with clear blue skies. 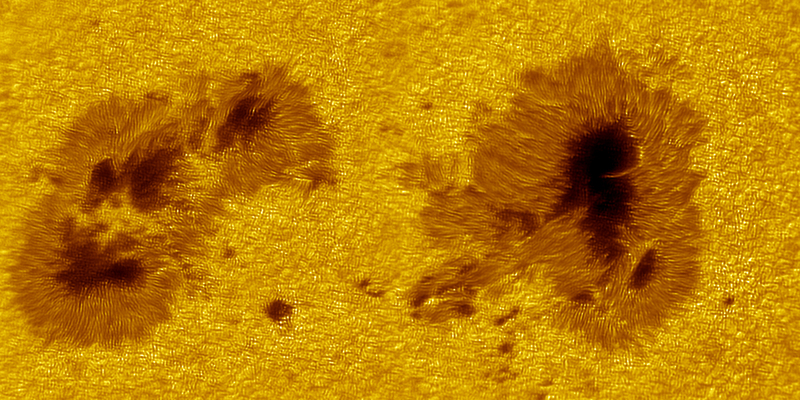 The image below is a 300 frame stack in 2-4/10 seeing conditions with the TS 115mm APO Refractor operating at F/17 with AstroSolar full-aperture filter and ASI120MM camera with Baader Green-CCD filter. 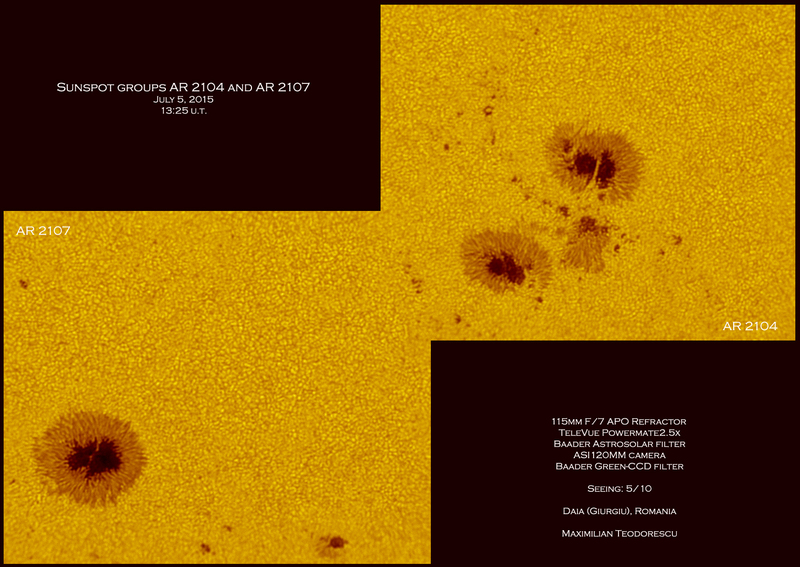 The two largest sunspot groups on the Sun this week looked quite similar on July 7, a day before my previous post. 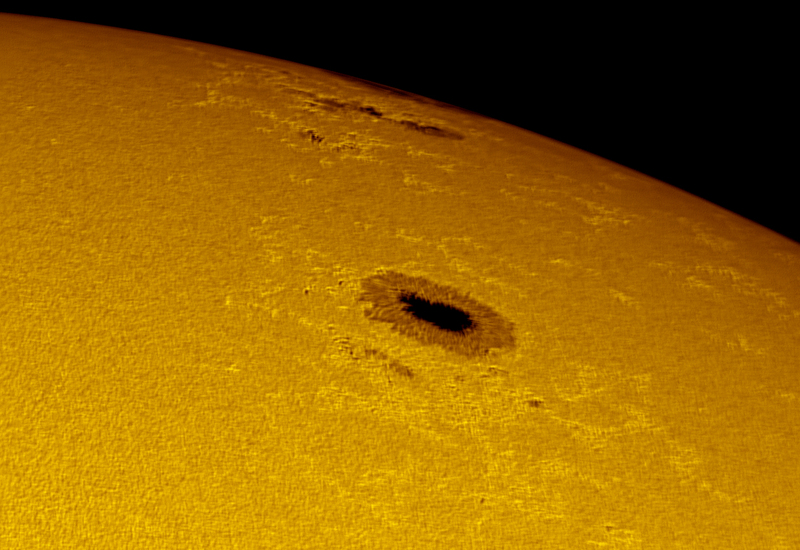 This time I’ve used my 115mm F/7 APO Refractor at F/22 and F/35, the ASI120MM camera with Baader Green CCD filter. Seeing 5/10. 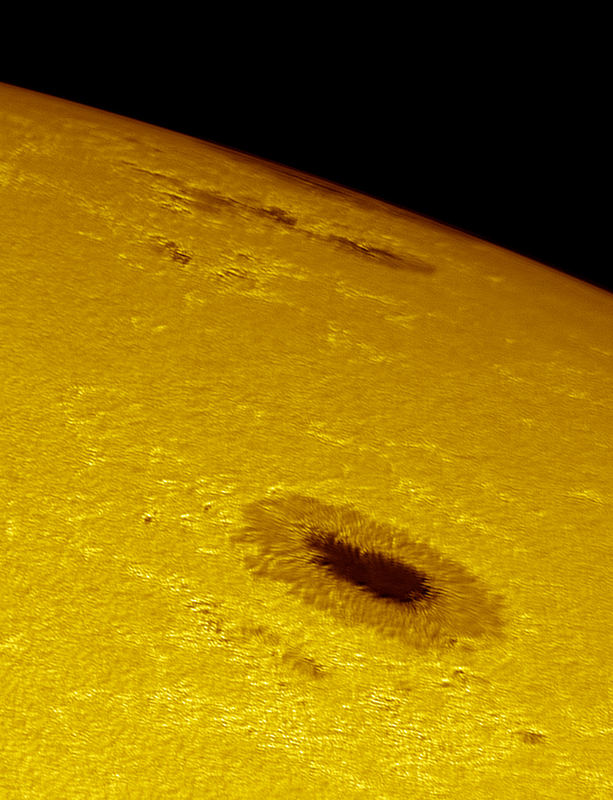 I have finally decided to get the C11 (280mm) SCT outside for a short solar astrophotography session. It was a good choice. 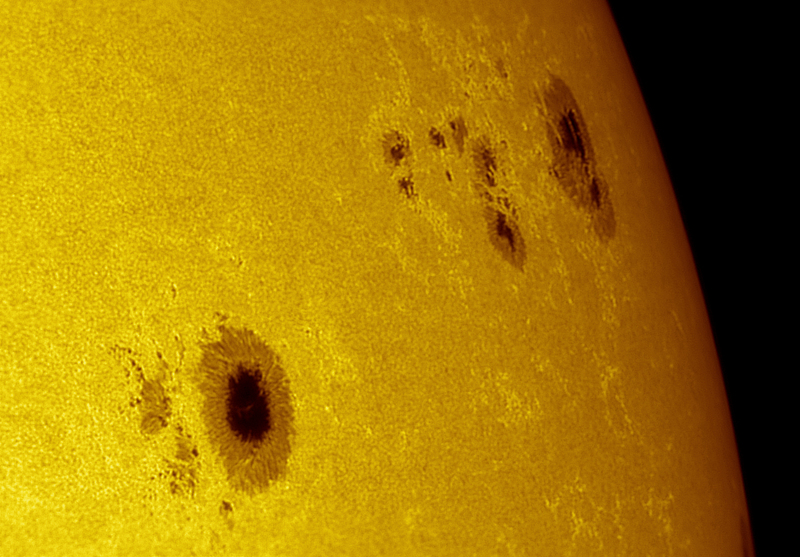 The view of the current Earth-facing sunspot groups was fantastic despite of very few good seeing moments. 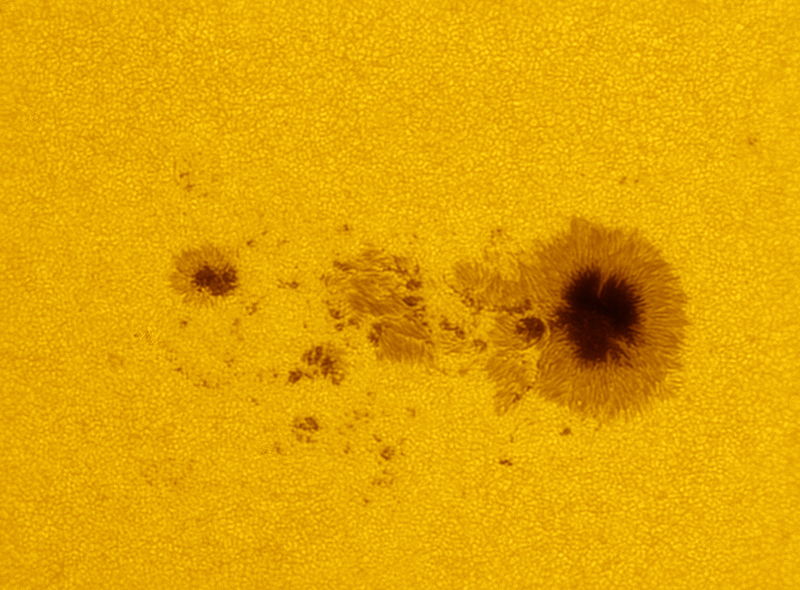 The equipment for the following images: C11 at F/10 and F/20 with full aperture AstroSolar filter, ASI120MM with Baader Green CCD filter. Seeing 4-5/10. 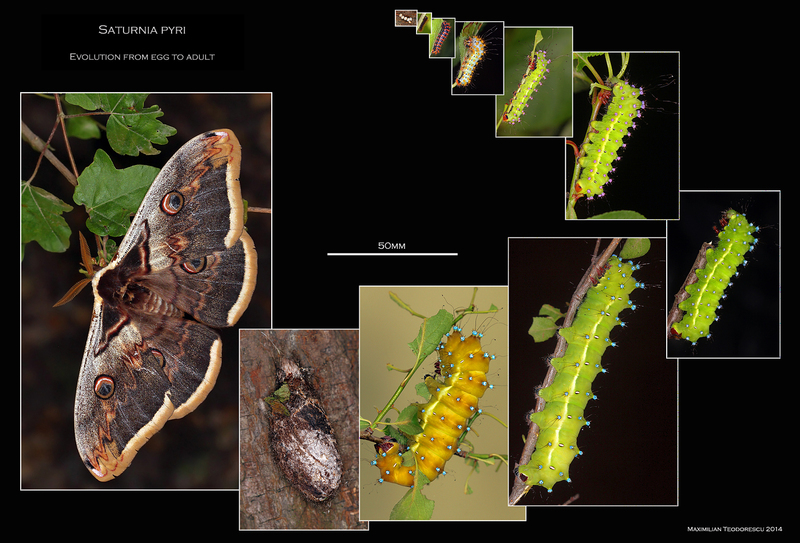 And close-ups of each of the groups. The main spots of each group were very interesting with lots of inner details and fine structures visible, despite the rather poor seeing conditions.